So until we get back up and running....don't have TOO much fun without me. Apparently I talk with my hands quite a lot! And I say the word "freakin". LOL Oh man, what a NUT!! Here's the skinny: "According to the rules... Each player of this game starts with the "6 Weird Things about You". People who get tagged need to write a blog of their own 6 weird things as well as state this rule clearly. In the end, you need to choose 6 people to be tagged and list their names. Don't forget to leave a comment that says 'you are tagged' in their comments and tell them to read your blog!" 1. I like the feel of cutting things. Wow, that sounds terribly morbid. LOL Let me clarify a bit. More specifically, I like cutting fabric. There's nothing like the feel of some really good sharp scissors slicing through layers of cloth. And that little twing of Gingher scissors always reminds me of my childhood. (My Mom had radar hearing if we ever picked up her nice scissors. I must have gotten that from her.) I also like chopping hard foods like carrots and apple slices.....same reason, the feel of my favorite razor sharp knife..... Yes, I know. WEIRD! 2. 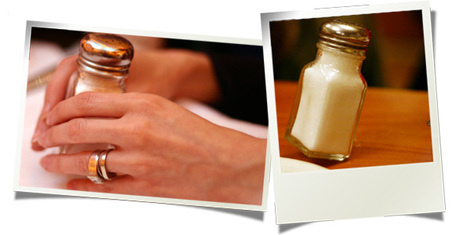 When at a restaurant I like to try to balance the salt shaker on a grain of salt. I learned this feat from a high-school friend. It drives *Henry* nuts so I have to control my urges....but I did practice this little circus trick while in Chicago with my digi-girls. In fact, Shawny snapped a few pics of the process. 6. Ugh, I'm embarrassed to admit this one. I'm a joint cracker. It's a horrible habit and I can't stop. I've been popping my knuckles since 4th grade when it was "cool". Now, it is totally uncool...but i still do it. I even do it in my sleep. (So I've been told.) And what's worse is I can, and do, crack nearly every joint in my body. Ewwwwwww....so un-lady like. Any tips to break this really bad habit? Thanks for reading, friends. Happy Thursday! ....and I am soooo behind! I'm always sort of a "fly by the seat of my pants" type of girl, but when the babies get sick, it totally disrupts my already over-scheduled agenda and balls start dropping left and right. Starting last week Olivia was complaining of a tummy ache. I was a little worried, but nothing to keep me up at night. Then on Saturday night little Gray threw up....and then olivia threw up (still not quite sure if she was really feeling sick at the time, or just watching Gray did her in. )....then Gray again....and Olivia. Ugh. This pukie pattern continued throughout the rest of the weekend and the beginning of the week. Olivia made a semi-fast recovery, and left baby Gray back in the germie trenches. I put him on an exclusively clear liquids diet and made an appointment with the doc. (By this time he was running a fever and horrible diapers too!) Just as I suspected...the Doc gave the dreaded diagnosis of Rotavirus. Blech!! I know it's common, but these type of illnesses really irritate me! We do EVERYTHING I can think of not to get those nasty little germs....I use a shopping cart cover, we wash hands ALL the time, and antibacterial wipe to the point of obsession, etc. Still, because SOME person we probably don't even know did not wash their hands after using the restroom (EWWWWWWWWW) and contaminated something that my kids touched....now we've had days and days of torture. Sorry for the rant, it just TOTALLY grosses me out. (And quite truthfully nearly puts my germ phobic hubby *Henry* right over the edge.) Anyhow, we are just now starting to see improvement in little Gray. We made it all through the night without any bodily fluid explosions. Phew!!! Now to try to advance his diet and see if we can get some more weight back on the poor little thing. He's looking sooo scrawny! On to a happier note. I have a little tooting of my own horn to do. I already spilled the secret at DST, but wanted to share here as well. 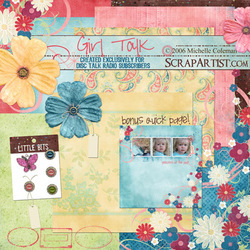 It looks like I'll be joining the FABULOUS group of shabby artists at this cool place. 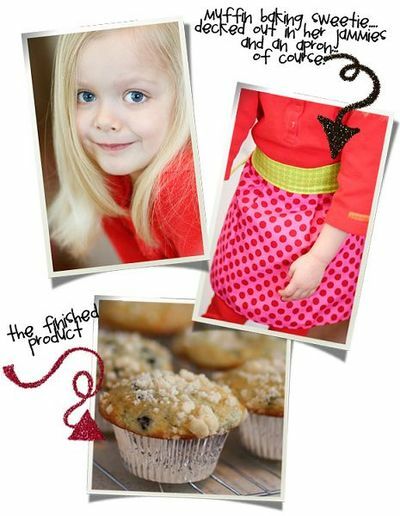 You heard me right....I'm on the SHABBY PRINCESS creative team. Is that not the COOLEST!?! I still can't believe it. I had to read her invite over and over and over. Surely she was mistaking!! But no, it's been confirmed, and I'm just delighted. :) Thanks again SP! I'm telling you girls, you NEED to try these muffins. They're like comfort food goodness baked in a little pleated cup. Perfection. Of the 10 that we baked, there are only a few left. :) Hey, they're made with love....which makes them calorie free. Right? Right. While our muffins were baking, we looked outside and saw that it had SNOWED. FINALLY!!!! This has been the craziest winter for weather. Earlier this week it was 50 degrees....EXTREMELY warm for here. Now I'm not complaining as it's been great for building a house (Which, BTW, I need to put up some pics of the process. It's kind of fun to see the transformation. They are doing sheet-rock now, and it's SOOOO neat to see it coming together.) but our kiddos love the snow, so it's like a party on the days we get some white stuff. So when baby Gray went down for his nap, we grabbed our snow garb and headed out for some fun. All the cool photo frames are by Nancy Comelab. Go snag them here!! and the chance to win one of 3 custom pages made by me. *blush* So anyhow, go sign up!! 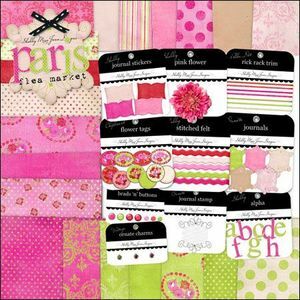 Besides that you get to learn of some other REAL designing and scrapping inspiration out there!! It's very cool! Enough about me. 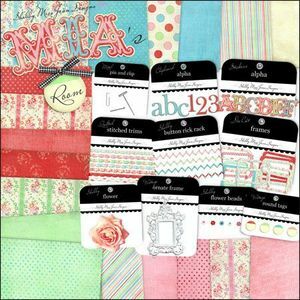 LOL Have you all seen the new kits out by Shabby Miss Jenn? When I got the email with the previews last week I just about DIED! Are these not the most fabulous kits?! (Click HERE to be taken to her store!) I was even able to scrap with them a little bit over the weekend. I made some labels for a fun little secret project that I'll share in the next little while. (You will LOVE this girls!!) And then I combined goodies from both kits, and threw in some floof from a few other designers to make this page of my little Livy. Speaking of Miss Olivia-Louise, I got a text from my sweet Jaynie (aka NellieRose) yesterday about the magazine I mentioned a few weeks ago....the one where Jayne is PUBLISHED. (One of the many actually, cuz she totally ROCKS.) Anyhow, Jaynie sent me a pic of the page in the mag...AND it's in the contents section too! WOOOOOOOOOOOOOOT!! So excited to see it printed out IRL. Isn't it such a great page?! I LOOOVE it, and I adore Jayne. Not only for her scrapping style and for getting my little cutie-pie in a mag, but because she is such a wonderful person. I am so blessed to know her. Okay, this is turning into a MUCH longer post than I had planned. LOL I've got to run. Whipping up a quick batch of chocolate chippers with the kids and then heading over to my Mom and Dad's for our bi-weekly Sunday dinner. Hope you've all had a good weekend! Wishing all my blog readers the BEST of luck in the new year! 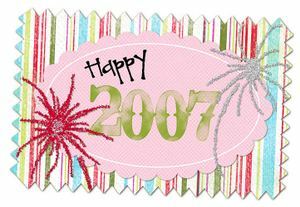 I hope 2007 brings you all the happiness, prosperity, and creativity in the world. And with that said, I'm going to go throw on an apron and get down to business. Cleaning business, that is. LOL I have an uncontrollable urge to deep clean every surface of this house! Hey, January 1 is a fresh start...might as well begin with a spotless and perfectly organized house. Wish me luck! digital art by Shabby Miss Jenn....go get it HERE!